Seeing the same musical twice in less than a few months apart makes it difficult not to compare. Such is the case with Moonlight’s “Little Mermaid” in July that earned raves from yours truly and this current show passing through San Diego’s Civic Theatre by way of Pittsburgh CLO Kansas City Starlight production running through Sept. 24th. One indoor, one outdoor, one looking big budget glitz, tons of aerial flying, bubbly sea foam and great projections (no credit listed) the other big budget with less glitz but more heart and both with some hard hitting players on different levels. “The Little Mermaid”, a Disney Production, with music by Alan Menken, lyrics by Howard Ashman and Glenn Slater and book by Doug Wright is based on Hans Christian Andersen’s 1837 fairy tale of the same name. 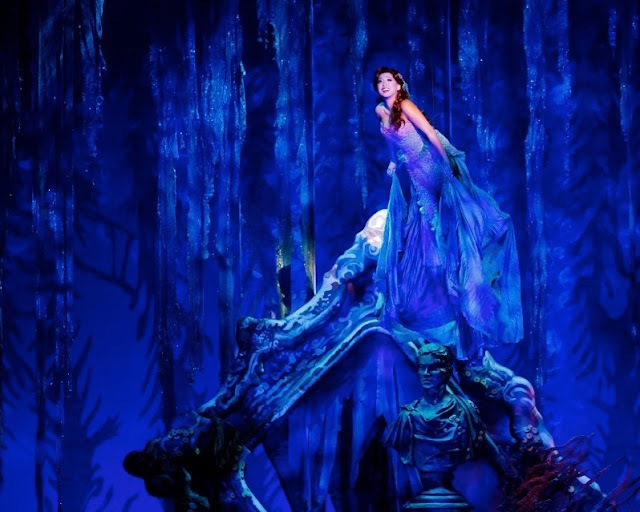 Simply put, Ariel (petite and in fine voice Diana Huey, “The World Above”) the Mermaid wants to be a person with feet to walk with and have no fins. She wants live with people not fish. She wants to do people stuff and longs to become hooked up with the handsome (not known to her) prince (Eric Kunze) who would rather be out on the seas with his mates rather than in a stuffy Palace eating the fish (from the sea) and entertaining guests. Adding to the drama (very little) Ariel was blessed with her mother’s gorgeous voice and while her six sisters all sing, none compares to this little mermaid’s. Sebastian is their music teacher. The King assigns Sebastian (Melvin Abston “Under The Sea”) the crab to look after her but Sebastian is…well a crab, and more that keeping tabs on her she is out of his sight faster than you can say crab-cakes. 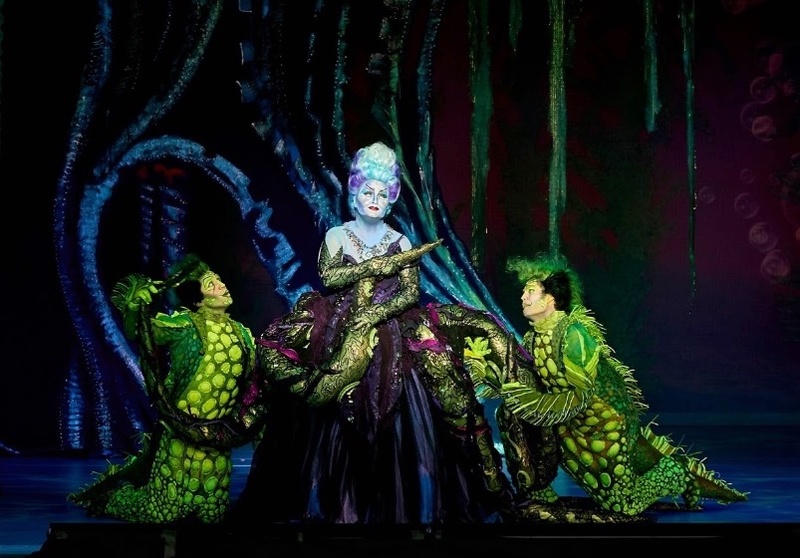 The drama does set in when Triton’s ’s sister Ursula (Jennifer Allen “Daddy’s Little Angel”) one of the more sinister sea monsters, at odds with her brother for her share of the sea, has some secret powers to use in aiding Ariel to make her dreams come true. After all the fanfare, things get put back where they belong ‘cept for Ariel. We are led to believe that she (a mermaid) and he (an earthly Prince) live happily ever after. It’s Disney after all and my guess is they will find a place. Technical support is top notch with Paul Rubin’s choreographed flying sequences (and there were many) John MacInnis’ choreographing, Colin R. Freeman, musical direction, Kenneth Foy’s scenic design, and Amy Clark Mark Koss costume designs and with Glenn Casale directing. I couldn’t help notice all the San Diego connections in this touring show; actors who started their careers here and went on to national attention on Broadway. Eric Kunze, whose Prince was charming. He could win any mermaids heart. Eric up in the North County and years ago could be seen in any number of shows like “Joseph” at Moonlight. Steve Blanchard, who for years played the (Green) Grinch at The Old Globe turned the green grouch to the loving father who wanted nothing more tha his daughters happiness afteer a fashion. I caught up with Jennifer in New York after her performance in "Guys And Dolls" on Broadway in 1992. Yes. Home grown and charming and Ursula. Jamie Torcellini is a hoot as Ariel’s friend Scuttle the Seagull (“Posituvity”). He dances and plays havoc with the English language. Torcellini also got rave reviews as Doolittle in Moonlight’s “My Fair Lady”. 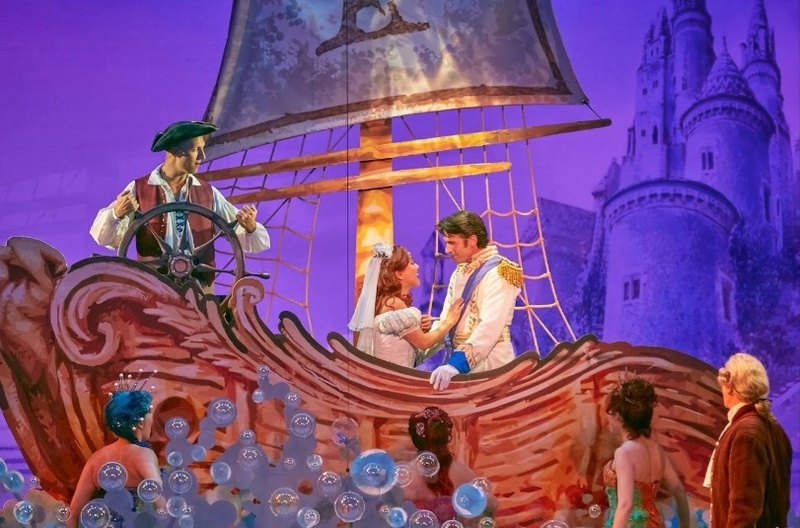 From Moonlight to Broadway and back to San Diego hat’s off to the lively cast and crew of this “Little Mermaid” not to be confused with Moonlight’s “Little Mermaid”. That one also won high marks with Randall Hickman as Ursula and some pretty awesome local actors. And "Who Knows?"